Hidden inside Apple's Xcode developer tool is support for quad-core ARM CPUs, hinting at next-generation processors that will power Apple's future iPhones and iPads. 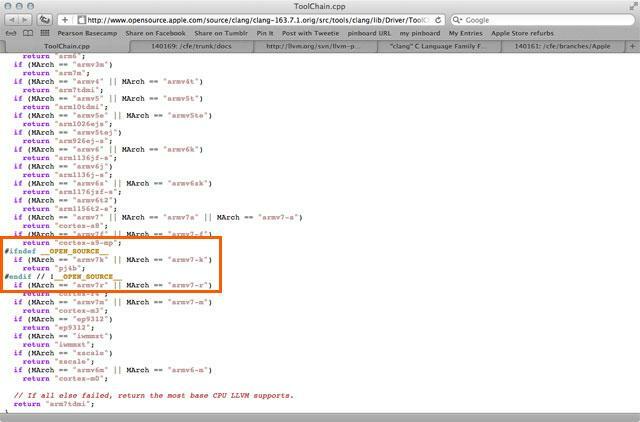 The references found in the default compiler in Apple's Xcode were discovered by ArsTechnica on Friday. They show that Apple recently added support for Marvell's quad-core ARM-based Armada XP processor. Author Chris Foresman concluded that it's "most probable" that Apple is using the Marvell chip in prototype versions of future iPhones and iPads. The existing chip could serve as a placeholder while Apple works on its own custom-built next-generation processors. Reports have indicated that Apple's next anticipated ARM CPU, dubbed "A6," will be built on a 28-nanometer process and use 3D stacking technology. There has been no mention of a quad-core ARM CPU from Apple in 2012. The A5 CPU found in the iPad 2 is a dual core processor. It's also possible that the Xcode references signal that Apple will begin using Marvell chips in future iOS devices, or even a next-generation MacBook Air, something that Apple has been rumored to be testing in its internal labs. However, Foresman noted that Intel's next-generation Ivy Bridge and Haswell processors are built on an advanced 22-nanometer process that will boost performance and improve battery life, while ditching Intel would require developers to recompile Mac OS X software for ARM-based Macs. Apple's so-called "A6" CPU is believed to be in trial production for a 2012 launch, presumably in a third-generation iPad. The company is believed to have even signed a new foundry agreement with Taiwan Semiconductor Manufacturing Co. to build an "A7" CPU, which would be projected to debut in devices in 2013. Apple began designing its own chips following the acquisition of boutique microprocessor design company P.A. Semi in 2008 for $278 million. Then in 2010, Apple acquired Intrinsity, another chipmaker, for an estimated $121 million. Apple's custom chips debuted last year in the first-generation iPad, in the form of the A4 processor. That same chip later appeared in the iPhone 4 and fourth-generation iPod touch, while the A5 debuted this March in the iPad 2.